Made with a fabric that consists of recycled yarns leftover from other fabric runs, this light weight intermediate brim hat becomes one-of-a-kind with its own blend of yarn colours. Fabric is a blend of recycled yarns – 29% hemp; 28% organic cotton; 36% polyester; 7 % rayon. 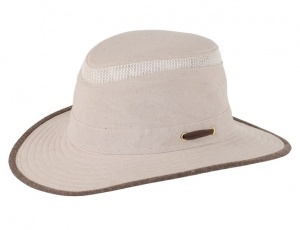 Although Tilley Hats block 98% of UV rays, some rays COULD enter through the 3/4" mesh.